Travel Snacks To Throw in Your Carry-On to Fend off Jet Lag and Keep you Full! Eating on the go can be tough, especially if you are flying. Options at airports are often overpriced and healthy options are hardto find. 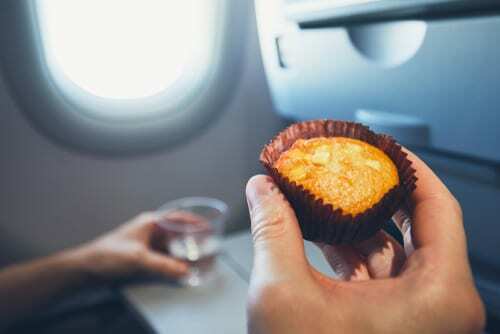 Spare yourself the mid-flight hunger pains with these healthy, TSA-friendly travel snacks. Almonds offer a satisfying combination of protein, fiber, and healthy fats. In addition, these go-to travel snacks is full of vitamins and minerals, including vitamin E and magnesium. Toss in your bag to eat on their own or grab a package of Greek yogurt at the airport and throw some nuts on top. Not only can tea ease hunger pains in a pinch, but it can also aid in fending off jet lag, making it a great option when you are looking for travel snacks. One of the biggest causes of jet lag is dehydration, which is difficult to avoid when flying. Opting for a drinkable hunger-fighter like tea can help fight those nasty symptoms. We suggest throwing a bag of tea, such as Pukka Peppermint & Licorice Tea, in your carry-on. This specific tea has no caffeine (which you should avoid when flying), is subtly sweet, and can ease nausea and hunger due to the peppermint. Sandwiches are the perfect mix of protein, complex carbs (with the right bread and veggies), and plant-based foods. The options are endless when it comes to packable sandwiches. Opt for peanut butter and banana on wheat bread, or turkey and cheese with tons of veggies like cucumbers and spinach on sourdough (sourdough is easily digestible and will not cause bloating like other breads). Sabra sells 2-ounce hummus packs that are perfect for tossing into your carry-on. With plenty of protein and fiber to fill you up, hummus is a great way to get in some extra veggies – just don’t forget to pack some celery and carrot sticks for dipping. Squeezable packs aren’t just for kids anymore! This snack from Mamma Chia combines fiber-rich chia seeds with banana and mango, kale, spirulina, and more. Just one pouch offers 1200 mg of plant-based omega-2’s and a boost of protein. Check our blog every week for tips and tricks for traveling, reviews of resorts and destinations, and much more! Call us at 402-281-3022 today or stop in our office – walk-ins are welcome!